Q. Why does Maryville Electric trim trees? A. We do it to improve power reliability and to ensure the safety of our customers and crews working in the field. We use a four-year cycle meaning that trees planted under or their branches growing in the way of power lines are trimmed every four years. Although weather patterns can affect the reliability of our electric system, tree trimming keeps customers out of the dark. Q. How are trees trimmed? A. Our number one goal is to keep trees healthy while making sure they don’t interfere with power lines. We follow the lateral pruning method developed by the International Society of Arboriculture (ISA) and approved by the National Arborist Association, and the National Arbor Day Foundation. Lateral pruning keeps the overall structure of the tree strong and more resistant to high winds and heavy ice. Future growth is directed away from power lines. Maryville Electric no longer "tops" or "rounds" trees. Topping is discouraged by the National Arbor Day Foundation because it makes trees more susceptible to disease and insect problems. Q: What can I do to help so I don't end up with having to have my trees trimmed? If you look at the picture above, never purchase a tree that is going to exceed 25 feet.The tags on the tree lets you know the maximum height before you purchase it. A few types of trees are suggested in the picture. 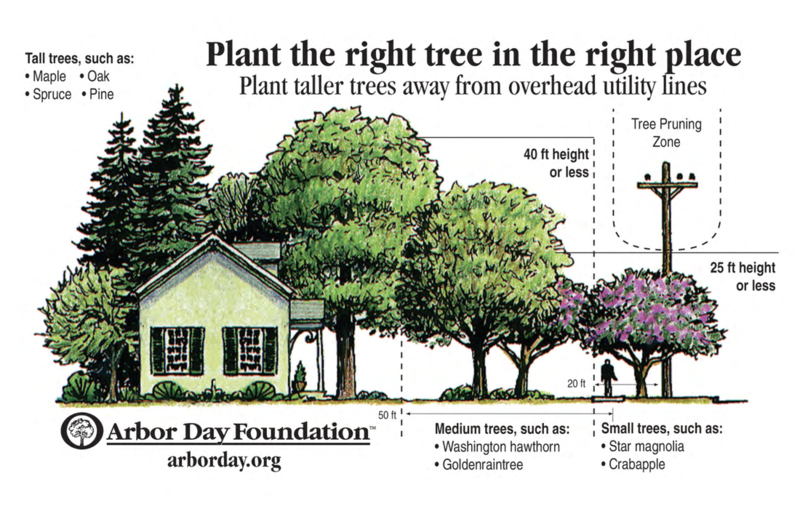 The tree trimming zone is 20 feet, so when planting a larger tree, make sure it is at least 20 ft. away from a power line because eventually that tree will not only grow in height but also in width, putting its limbs in the way of the power lines. Shrubbery is another great option to plant near a pole. This option would prevent ever having your landscaping trimmed because it is too tall and close to the lines.